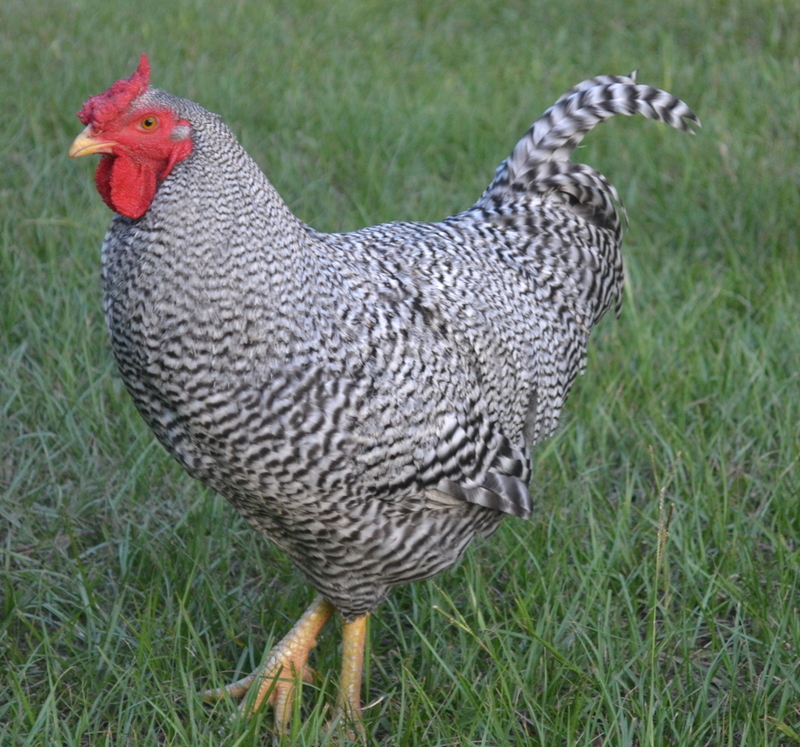 This breed is distinctly American, dating way back to the early days in New England. 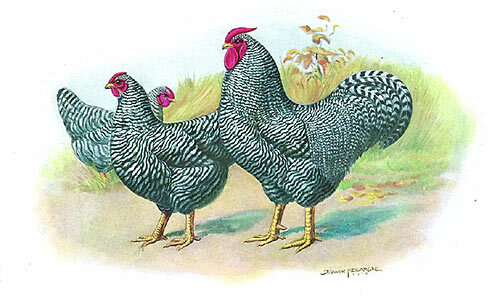 Pioneers brought these west with them, and in the old days almost any black and white barred plumage chicken was referred to as a Dominiker. 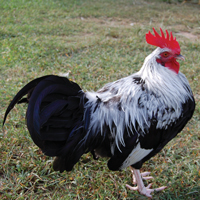 They have rose combs, medium sized bodies, prominent tails, and black and white barred plumage. Do they lay green eggs? They are shipped Priority Mail to your post office. Dominiques are a fair layer. They will lay 3 or 4 eggs a week. Good Backyard BreedOrdered 25 straight run chicks. They are 14 months old now. Kept in a coop with a decent sized run during the day and totally free range in the evenings and all weekend. About 18 weeks old I started culling the roosters for food. They have a nice taste and are best fried at this size. The birds are on average significantly smaller than the more common breeds. The hens started laying about 25 weeks old, this was in December in the south. They really became turning out the eggs in Feb and continue to be better than expected layers. I've calculated the eggs per week at different times from about 32 weeks. They have reached up to almost 5 per week per hen but I consistently get an average between 3 and 4. I have 11 hens and 10 that seem to be good layers. I get 4-6 eggs per day. I've read mixed things about their broodiness but I can assure you this flock is strongly broody and I've left on batch of eggs be hatched by a hen and have confidence that it would be fairly easy to hatch another batch. There is a decent variation in size among the hens but again they seem to all lay well. The rooster I kept has become off color over time with more yellow and reddish tint than the sharp black and white when he was younger and the other rooster seemed to be brighter but they didn't make it to full maturity. Overall, I would recommend the breed for someone who like heritage birds and also looking for a good forager and all around back yard bird. Not too pleasedThe female we had was little and punky.